When I started at the Krakow Post as a humble janitor 30 years ago, I dreamed of one day occupying the big leather editorial chair in the corner office on the 68th floor. In many ways I was wrong, since none of those things are true or exist, but in one important respect—the one in my mind—I was dead right. I became the Managing Editor of this exemplar of newsprint in December—a decision that has been variously described as “indicative of corruption at the highest levels of power” and “one of the smartest moves in the history of the printed word.” The truth, as always, lies somewhere in between. Joking aside, I’m very aware that I’m taking responsibility for an entity that has been lovingly and professionally crafted by my predecessors, Anna Spysz and Nick Hodge, over a period of two and a half years. It’s a bit like standing at the top of a perilous spiral staircase with a seven-layer wedding cake. The potential for twisted ankles and cataclysmic frosting distribution is alarmingly great. I promise not to make any sudden moves or attempt advanced salsa steps. You will notice some changes in this edition, the first of my incumbency. My principal drive is to bring more, and more local, stories to our readers. Krakow is a large European city with all the fascinating, disturbing and amusing events that status entails. 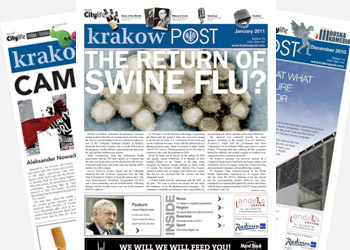 If, like me, you are slightly lazy about following local news in the Polish media, my hope is that the Krakow Post will become the go-to place for a one-stop English round-up of what’s been happening in our city. I’m aiming for shorter, more easily digestible news stories without losing the in-depth cultural stuff for which the Post has become well known. On a more superficial level I’m introducing some fun new features designed for easy consumption in the kind of places the Post is most frequently picked up and flicked through. In City Life ‘Street View’ invites you to photograph odd, infuriating or amusing sights on the streets of Krakow and send them in. You don’t need a Nikon D80; just point, click and email it with a comment. Another startling innovation in the form of ‘Beer of the Month’ provides both handy drinking tips and an excuse for me to sample Poland’s growing micro-brewing scene. At the back of the Post you will find two new features for those of you foolish enough to try learning Polish. Other innovations will come and go as popularity and inspiration dictate. Normal service will be resumed next month with a return to ‘Perspectives on Poland’ in this space—news that will warm the hearts of some and dramatically exacerbate new-year ennui in many. As always, my inbox is open to comments, bribes, hate mail, stories, ideas and outrageous proposals: editor@krakowpost.com. A healthy, happy and prosperous new year to you all! ← The Return of Swine Flu?